This article and photo was published by Al Fanar on Oct. 30, 2013. It was republished by The Chronicle of Higher Education on Nov. 6, 2013. The publication U.S. News & World Report plans to develop a university rankings guide for the Middle East-North Africa region within three years. U.S. News representatives announced the development in a presentation today at the World Innovation Summit for Education in Doha, Qatar. 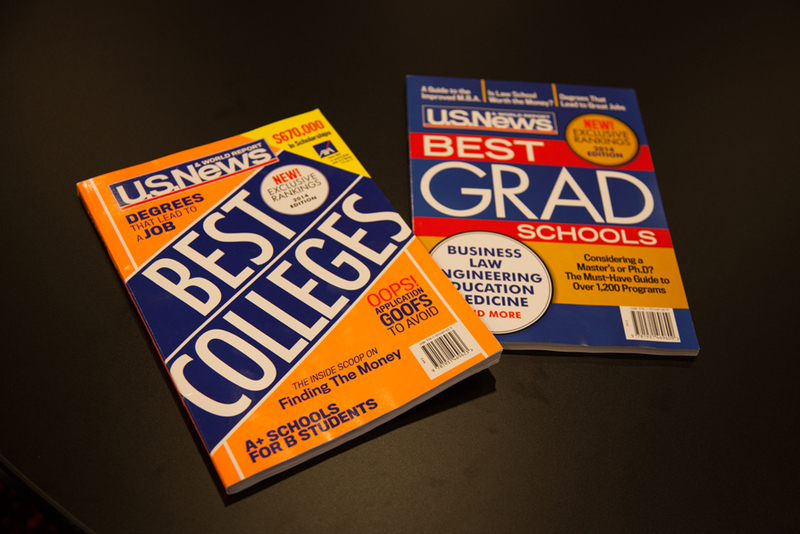 The publication is best known in the United States where it publishes an annual Best Colleges guide which ranks U.S. colleges and universities by a variety of criteria, including student retention rates, faculty credentials and budget resources. Brian Kelly, editor and chief content officer for U.S. News, explained the publication decided to expand to the Arab world because more international readers are coming to its website. About 10-15 percent of its digital audience comes from international IP addresses, he said. The project will be supported partly by a grant from Qatar Foundation, a nonprofit education organization that established the annual WISE conference and is chaired by the former first lady of Qatar, Sheikha Moza bint Nasser. Qatar Foundation also finances several European and American universities’ branch campuses in the country. When asked whether this would compromise the objectivity of the rankings guide, Kelly saidU.S. News would maintain control of the editorial process and rankings system. Robert Morse, director of data research at U.S. News, is leading the effort. In the presentation he acknowledged the project is in its infancy and he is still figuring out how to proceed. Key challenges will include persuading universities in the region to participate by sharing their data and determining how to compare schools operating in very different educational, linguistic and cultural contexts than what the publication is used to. Information typically made public in the United States such as faculty salaries and budget data would “probably not be available here,” Morse said. The MENA rankings guide will be rolled out in phases. This year, U.S. News will publish a directory of more than 800 universities from 19 countries on its website. In the beginning of 2014, it hopes to add search functions to the online listing. By the middle of next year, Kelly said they plan to start some data collection and full reports and products should be available by year three. Some attendees questioned whether MENA higher-education institutions would be interested in participating in the rankings. One commented that most universities in the region already have specific target audiences and are uninterested in competing with other universities to attract higher-quality students. Kelly acknowledged U.S. News could not force universities to participate. He said their goal is not to change higher-education institutions but to provide comprehensive information to students seeking the best education. However, earlier Kelly noted that when U.S. News first launched its rankings guide in 1983, many U.S. universities also were reluctant to comply. MENA institutions will eventually come to realize that transparency is “a virtue,” he said, and that they need to evolve to compete on a global scale.